DirectX 12 is the latest in the long line of Windows system software suites that’s designed to help applications work directly with your video and sound units. It’s an API, or application programming software. Primarily, it’s used to allow video games and animation software to make the best use of the hardware installed in the system. Video games, animation, and modelling software using DirectX 12 can make use of a plethora of features including the multimedia accelerator options to help software more efficiently. Here, we’re going to look at how you can download and install the latest version of DirectX 12 with all patches included for Windows systems. Here, we break down the steps of installing the latest version of DirectX 12 to your system. Check to ensure which version of DirectX you already have installed, if any. The DirectX Diagnostics Tool can help you do this. You can access the DirectX Diagnostics Tool by typing dxdiag in the Search box and clicking on the matching feature. Visit this DirectX 12 download link and follow the instructions on the page to save the DirectX End-User Runtime Web Installer. If you are on a Windows 10 system, you can also run the Windows update system to see if a later version of DirectX 12 is available. Run the End-User Runtime Web Installer and complete the steps as shown. The latest version of DirectX 12 is not compatible with any systems that don’t run on Windows 10. This means that if you are on Windows 8.1, 8, 7, Vista or any older versions, you will need to install an older version of DirectX instead. There’s no official way to uninstall DirectX. You may find older versions of DirectX still on your system, with obsolete files in your System 32 folder. They don’t take up a lot of space and cause no harm to your system, so you can leave them alone. It’s unwise to delete System 32 files, in any case. If you are on Windows 8 or 8.1, DirectX 11 is still supported and available on these systems. Neither Windows 7, Vista, or any other older systems are still supported, so finding updated files for these operating systems can be difficult. DirectX 12 works with the vast majority of graphic and sound cards active at the time of its release on 29th July 2015. This includes any Nvidia cards since the GTX 400 series and any Intel or AMD cards released since the HD 7000 series. Cards released before those series may or may not support it, and 100% of cards that work with Windows 10 should be able to. 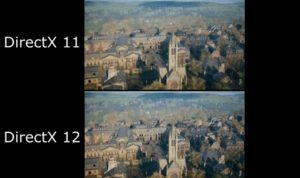 DirectX 12 marks one of the most ambitious, yet subtle leaps in the API’s history of development. Here, we’re going to look at some of the major changes and what they mean under a more technical lens. Lower level hardware abstraction, this means that video game and software developers are able to access options related to your multimedia hardware that they were previously unable to. As a result, many programs that have been built specifically to favor the kind of card you are using can get a lot more out of it. For instance, there are a range of PC games being designed specifically for maximum performance with Nvidia or AMD cards. Improved multicore performance means that games and other software will run much better on systems with multicore CPUs. Previously versions of DirectX worked with one command at a time, in a queue, meaning that no matter how many cores your CPU had, it submitted one draw command at any one moment. DirectX 12 opens up multicore systems so that multicore CPUs can send simultaneous commands to the GPU, allowing for great performance. Draw call overhead reduction targets the fact that past versions of DirectX used a large amount of CPU power processing API instructions. Now, that overhead reduction means that more of those CPU resources can instead be spent on running the games or software you’re using, instead. Practically speaking, this means that games and software that use DirectX to process a lot of different graphical elements, such as grand strategy games, are able to process them a lot more efficiently. Less power is spent on draw call overhead, more on running the actual software. Practically, gamers might not notice a huge difference between DirectX 11 and 12 immediately. It doesn’t offer new rendering options or a massive jump in frames per second. However, it does help games use your video and sound hardware a lot more efficiently, meaning that games will run more smoothly with enhanced graphics. Your mileage with DirectX 12 will vary, depending on your hardware. Multicore CPU systems have the most benefit to gain, but the only systems that run games better with DirectX 11 are those that aren’t compatible with the latest version. To get the best mileage out of your DirectX 12, it’s worth noting that there are several games built specifically with DirectX 12 support. This doesn’t mean that other games won’t work with DirectX 12, it simply means these are the ones designed for it. Alongside the games, we will note those that are DirectX 12 exclusive (meaning they won’t work with other versions) and those that offer Multi-GPU support. Keep in mind that DirectX 12 as an API offers significant advantages to all users, not just those playing the games mentioned above. Other games are developed to support certain graphics cards, like Nvidia and AMD, and DirectX 12 can help games access that hardware more readily. More games are likely to be continued to be developed specifically for DirectX 12, however. If you want to get the best out of the latest games, then using a Windows 10 system alongside DirectX 12 is your best bet. Hopefully, this guide helps you understand the vital role that DirectX 12 can play in all applications that make use of the video and graphics cards installed on your system. From improving video game performance to enhancing the options available to software developers, animators, and 3D model app users. All you have to do is follow the links and instructions featured above to install it and get a lot more out of your favorite software.